The VCS Radio Conservatory recently utilized Flicker Alley’s A Trip to the Moon. What is the VCS Radio Conservatory, you ask? The VCS Radio Conservatory is the arts and broadcasting department at Vacaville Christian Schools. It’s a music studies program! The conservatory encompasses the VCS Radio Symphony; with the symphony’s film scoring program, students from 4th grade-12th grade can compose their own music for silent films and then perform their music in a live feature performance alongside the film. It started in 2007 with their premiere of the restored version of Metropolis. The director, Ralph Martin, who founded the program in 1985, is in his 32nd year as director of the school’s VCS Radio Conservatory and conductor of the VCS Radio Symphony Orchestra. He’s centered a major part of his students’ studies around film scoring, synchronization and performance–especially early silent cinema. Martin informed us that it takes the students about seven weeks of study and rehearsal before performance. Composition for a film can take up to 12 weeks and generally overlaps the rehearsal schedules. The study and rehearsal time depends on many factors; length of the film is one consideration. Silent movies require almost constant music; much more than modern sound films. A two-hour feature requires two hours of scoring. A few of the films the students have performed were about two and a half hours in length! Another factor is the film’s scoring needs. Some feature films still have their original scores and parts available. However, much of the silent films’ music has been lost or badly damaged over the decades. These scores have to be reconstructed, taking more time to prepare. Films that lack original scores altogether take the longest time. For these, the students compose a completely new musical work. 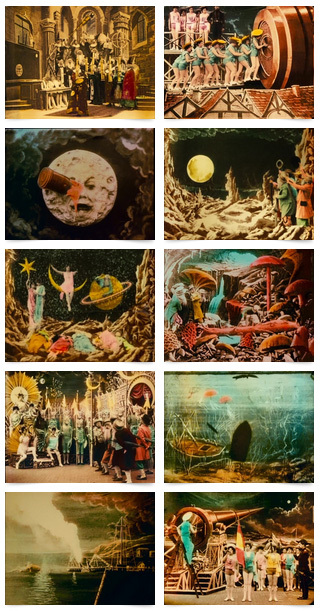 Aside from many film shorts, the students have composed complete original film scores for two silent features — Peter Pan (1924) and Murnau’s Sunrise (1927). The Lost World – (1925 / 2018 adaptation) will be their third feature-length score composition. The students have already started creating the motifs and themes for this project, which will be performed this summer. Recently the students performed, Georges Méliès’ A Trip to the Moon, composing their own scores to play onstage. Live score for animated film shorts with sound and dialog separation.